The other day, I bought the Partheno with the sauce to the side but after a while, I felt like buying this one and my whole family and I agreed on this. Even my husband who has no interest in yogurt got obsessed and eats this all the time. But, I haven't tried the plain flavor yet. Because, this yogurt is definitely a dessert. Except for the plain flavor, I loved all of the other flavors but right now, I'm into the blueberry or kiwi. The yogurt itself is a little sweet and the sauce is on the bottom but you don't have to mix it up. I'll definitely buy this again! I don't really like yogurt but I know it's good for your skin and also constipation so I force myself to eat it. But for this, I actually enjoy eating this. I like the honey type but when I eat this with maple syrup, it tastes more like a dessert and it's so good. But, well I don't like yogurt from the beginning so I'm not obsessed but for anyone like me, who's forcing themselves to eat yogurt, you might want to try this. I've been attracted to Greek yogurt due to the rich flavor and the high-protein, low-sugar selling points, and out of all the one's I've compared, the Partheno series is by far the best. Oikos is more hard than thick in texture. Like, enough that they really didn't need to take out that much of the liquid from it. Still good for snacking. 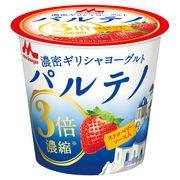 Chichiyasu's Greek yogurt is closer to normal yogurt, so I guess it's aimed at people who aren't used to Greek yogurt. When you get used to eating Greek yogurt, it's just not enough. It has the same yogurt flavors, but they also have limited edition ones, so I love the variety of flavors. I really with the mikan flavor (orange flavor?) one they're selling now would become a standard flavor. I love this yogurt! It's firm enough that you can turn your spoon upside down without it falling out. They've got ones with sauce to add for different flavors, so you can try different ones depending on your mood. It's on the pricier side, but I could eat this every day.